There’s a lot of chatter online right now about the renaming of cuts of pork. When it comes to a pork chop, I tend to go for the thickest cut, bone-in chop at the butcher. They can be grilled without drying out and can take a nice char. Next time you’re looking for a simple grilled chop, I recommend the Porterhouse Chop – formerly known as the Loin Chop. If you’re curious about cuts of pork, this is a great guide. Last weekend, before my week trip to the midwest and wild weekend in Asheville (why its been so quiet round here), I hosted a couple of friends for regular Sunday supper. 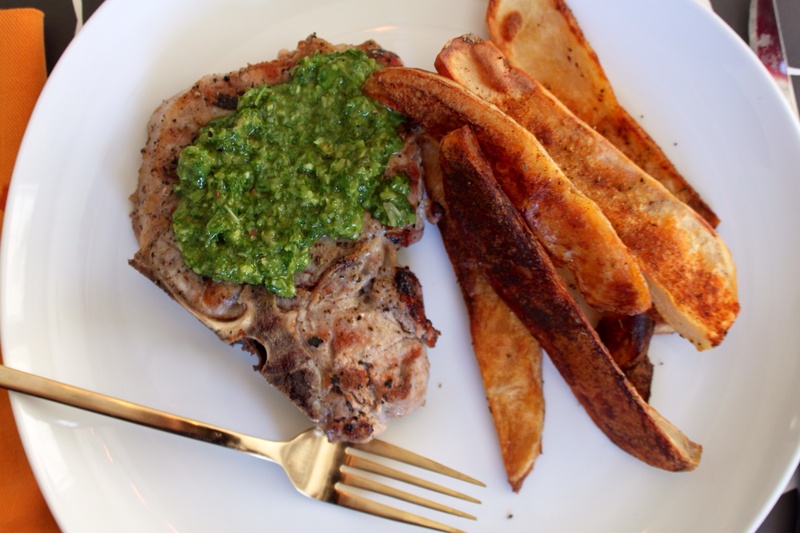 I grilled Powerhouse Pork Chops, roasted baked fries with sweet and salty paprika (my favorite from Savory Spice Shop) and make a simple green salad. The creativity came through with homemade garden chimichurri. Chimichurri is an Argentinean zesty blend of herbs, garlic, tangy acids and shallots. It is perfect for any meat but particularly good on a bone-in juicy pork chop. Porterhouse Chops only need a nice seasoning of salt and pepper, and several minutes on a very hot grill. Once cooked to your preference, serve with bright green and super tangy chimichurri! You’re friends will be very surprised if they think it is pesto! In a food processor, pulse all ingredients until nicely blended and bright green! Smear on grilled meats and bread! This post is sponsored by the North Carolina Pork Council.